I’m very tempted to give this book five stars, but I’m not sure I can give a young adult audio-book like this such a high rating. Eleven CDs kept me entertained while I was on the road for work this week. Matthew managed to keep me wide awake despite the long hours on the road. On many occasions I found myself holding my breath and gripping the steering wheel, hoping that Jason and The Bug were okay. 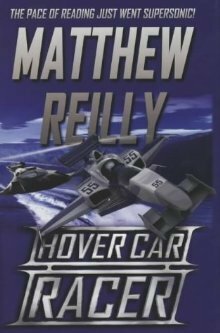 Hover Car Racer is essentially Matthew Reilly for tweens and teens. This is Matthew Reilly we’re talking about, the King of fast paced adventure that never lets up until the final page. He makes sure that every teen angst and tragedy befalls Jason Chaser, to the point that you hate all the bad guys for being so mean. Yes, I’m probably too old to be calling characters meany-pies. This isn’t really a book for adults, despite how much I enjoyed it. My wife found it a little too childish in language use for her liking, were I was able to ignore that issue, as the pace rocketed along. As such, give this to any young boys you have in your family, especially if they aren’t big readers. Hover Car Racer is likely to be one of those books that hooks kids on reading.